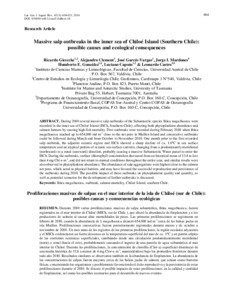 During 2010 several massive salp outbreaks of the Subantarctic species Ihlea magalhanica were recorded in the inner sea of Chiloé Island (ISCh, Southern Chile), affecting both phytoplankton abundance and salmon farmers by causing high fish mortality. First outbreaks were recorded during February 2010 when Ihlea magalhanica reached up to 654,000 ind m-3 close to the net pens in Maillen Island and consecutive outbreaks could be followed during March and from October to November 2010. One month prior to the first recorded salp outbreak, the adjacent oceanic region and ISCh showed a sharp decline of ca. 1.0ºC in sea surface temperature and an atypical pattern of oceanic sea surface currents, changing from a predominantly meridional (northward) to a zonal (eastward) direction, probably causing a massive Subantarctic Water parcel to enter the ISCh. During the outbreaks, surface chlorophyll concentration decreased from an historical mean of 13.8 to less than 4 mg Chl-a m-3, and did not return to normal conditions throughout the entire year, and similar results were also observed in phytoplankton abundance. The abundance of salp aggregations were highest close to the salmon net pens, which acted as physical barriers, and may have favored the successful reproduction and persistence of the outbreaks during 2010. The possible impact of these outbreaks on phytoplankton quality and quantity, as well as potential scenarios for the development of further outbreaks is discussed.